Purple Martins are on their way! What makes a good bird feeder? Attracting birds with the right foods. The regular visitors to your bird feeders don’t have the ability to migrate south when winter arrives, but they have various techniques that allow them to survive the cold days. 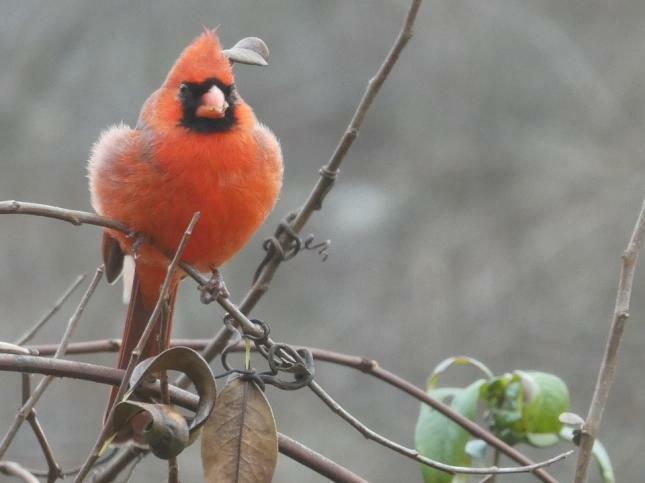 Unlike us, birds can not put on more layers to stave off lower temperatures. You may see them puff up their feathers to create air pockets, which in turn increase the insulating value of their plumage. They’ll also stand on one leg and have the other retracted close to their body for warmth. If you notice them ruffling their whole body it may be that they’re actually shivering. Any physical activity helps them to warm up. Each of these actions requires energy, and for that they need food, and that’s where you come in. Providing foods such as seed, suet, peanuts, fruit, and insects to birds can be vital to their survival. Natural water sources dry up or freeze over when it’s ten degrees outside. A heated birdbath might be the only place for birds and wildlife to get water. We have even seen squirrels and a fox sip water from our heated birdbath. Nighttime is when the birds seek out evergreen trees and bird houses for shelter. Our Bluebirds and Downy Woodpeckers occupy some of our nest boxes nightly. The four walls and a roof offer protection from the frigid air. Lastly, birds flock up as a way of surviving winter. A flock of birds in a bush is warmer then a single bird. Food sources are easier to find when in a flock. Also, flocks offer a measure of protection from predators such as hawks.